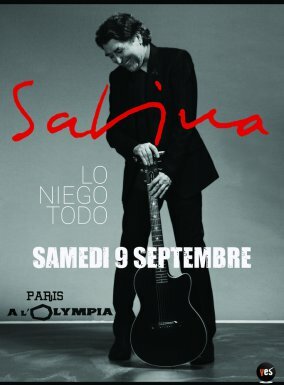 For the first time in his career, Joaquin Sabina will make a stop at the mythical Olympia in Paris, on Sept 9. Sabina´s comeback is always a reason for celebration, especially when it´s preceded by the release of a new album. Seven years after of "Vinagre y rosas" comes "Lo Niego Todo", his eighteenth studio album. The new tour "Lo Niego Todo" will begin in America in mid-April in Ecuador to continue through Nicaragua, Costa Rica, El Salvador, Guatemala and Mexico, dedicating the months of June to October to their concerts in Spain and returning at the end of 2017 to complete his American tour in Colombia, Peru, Chile, Argentina, Paraguay and Uruguay. This time, Sabina wanted to include London and Paris for the first time on his tour. The Royal Albert Hall in June and L'Olympia in Paris in September will host the new show where Sabina will not only present the new songs from his new album but also will make a journey all along his great hits.